Speech is a very powerful tool. If we hit someone, it will hurt for a short time and then go away. But if we verbally attack someone, those words can stay with them for many years. On the other hand, well thought out words can stop conflict, make friends and heal rifts. This is the power of speech and this is why Gautama Buddha included appropriate speech in the eight-fold path. Appropriate speech can be divided into four parts, namely refrain from lying, refrain from divisive speech, refrain from harsh words and refrain from gossiping/idle talk. When we tell lies it is obviously going to hurt and mislead others, but it will also harm ourselves. Nobody likes a liar, and once you get the reputation, it is difficult to lose it. Whenever you tell people things they will not believe you, even if it is true. They will try to avoid you and you will find it difficult to make friends. This will of course make you angry and frustrated, but you will only have yourself to blame. There is a bigger picture here too, as lying can affect the whole of society, especially if the lie comes from a person of responsibility and trust. I am thinking here of politicians. There are not many people in the world these days that fully trust their politicians. You hear people say that they only voted for this particular politician because he is the best of a bad bunch. The reason for this is because politicians have told so many lies over the years that trust has been lost. We must remember that we do not like to be lied to, so don’t lie to others. This will free your mind of any guilt and leave it calm and peaceful. Divisive speech refers to speech that is intended to create a rift or division between people. It is used to alienate one person or a group from another. People generally do such things when driven by hatred of a person, or to win affection for themselves, or if they are jealous of someone else’s success, or even out of some perverse pleasure of seeing someone fall from grace. You can see this type of speech in all walks of life, but it is more prominent within groups and in the work place. What is the antidote to divisive speech? It is speech that promotes friendship and harmony, speech based on kindness and compassion, which wins the trust and affection of others – that’s not so hard to do! Harsh words are usually born out of anger and cause harm and pain to the hearer. Swear words, bitter words spoken in anger, words used for scolding someone, or words that belittle the hearer or someone close to them are all examples of harsh words. They are designed to take away a person’s dignity. Harsh words may make you feel good temporarily but it will make the receiver feel downhearted. These words are usually spoken in the spur of the moment, and so are not as severe as words which are premeditated. However, it doesn’t matter if they are spoken on the spur of the moment or are planned, harsh words cause a lot of unnecessary pain. There are several antidotes to harsh words, but the most important one is patience. If we are patient and respect other people’s shortcomings, and do not react to others’ criticism, if we bear abuse without the urge to retaliate, and respect others’ viewpoints, we will not feel the need to let loose a barrage of abusive words. Gossiping is shallow and pointless. It is a form of communication that adds absolutely no value to anyone’s lives. It stems from the three poisons; desire, anger and unawareness. All it does is stir up everyone’s emotions and lead to negative feelings between all parties. Gossiping shouldn’t be taken lightly, as it can also lead to lying, harsh words and divisive speech. To counter this, which is not easy, you should watch what you say, when you say it and to whom. You should think before you speak – that is actually how we can counter all forms of inappropriate speech. I believe to ensure our speech is appropriate we should ask ourselves the following questions: Is what I am going to say useful? Is it going to hurt someone? Is my speech motivated by desire, anger or unawareness? Would I like other people to say the same things to me? 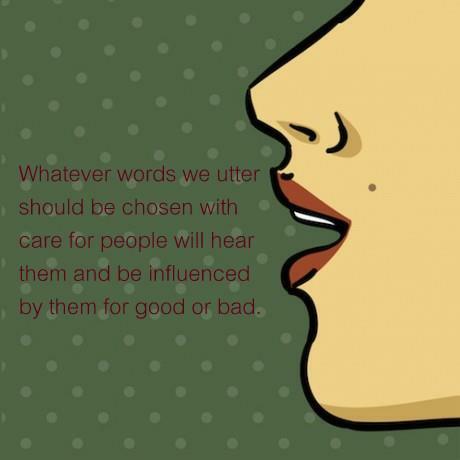 If we check our speech before we open our mouths, we will never speak words that do harm. Sometimes it is more powerful to say nothing at all. Before I finish, I just want to say something about the written word. In Gautama Buddha’s day this was not a problem, so he didn’t mention the Right Written Word. But today it is becoming a problem. The written words I’m talking about are newspapers, magazines, the internet and social networking sites, such as Twitter and Facebook. Obviously, freedom of speech is a human right, but if your written words are going to harm others or stir up trouble they should not be written. If you are going to write something down you should check your motivation. Is it going to be productive and helpful, or is it going to harm, be divisive or waste the readers’ time?